I had scarcely laid the first tier of my masonry when I discovered that the intoxication of Fortunato had in a great measure worn off. The earliest indication I had of this was a low moaning cry from the depth of the recess. It was not the cry of a drunken man. There was then a long and obstinate silence. I laid the second tier, and the third, and the fourth; and then I heard the furious vibrations of the chain. The noise lasted for several minutes, during which, that I might hearken to it with the more satisfaction, I ceased my labours and sat down upon the bones. When at last the clanking subsided, I resumed the trowel, and finished without interruption the fifth, the sixth, and the seventh tier. The wall was now nearly upon a level with my breast. I again paused, and holding the flambeaux over the mason-work, threw a few feeble rays upon the figure within. When I was in tenth grade, we were assigned Poe for Halloween. Mrs. Baletsa always assigned us more reading than I could manage to fit in with my other homework, but they were good books: To Kill a Mockingbird; Steinbeck’s The Pearl; Sir Gawain and the Green Knight. At the time, I wasn’t an avid reader. I read for the assignment, for the answers to the questions. This was where I always had difficulty; in retrospect, I think I was so interested in language that the oddness of words often distracted me from the story I was being told. We had elderly neighbors who were still rather sprightly (they had a yellow Lab they walked themselves) living next door. On Halloween that year, their granddaughter went into labor. Since they wanted to be at the hospital to meet their new great-grandchild, they asked me to house-sit for them and hand out their candy. I had nothing else to do but my homework. So it was in an unfamiliar house, on Halloween night, interrupted by neighborhood kids every three minutes, that I attempted to read “The Murders in the Rue Morgue,” “The Cask of Amontillado,” and “The Tell-Tale Heart” for the first time. It was not an old or drafty house, no strange hideaways or player pianos, no unannounced lightning storm, but I think I left the TV off (they didn’t have cable), and against Poe’s description of voices buried deep within walls, hearts beneath floorboards, bodies shoved up into chimneys, the irregular settling creak managed to make itself known. 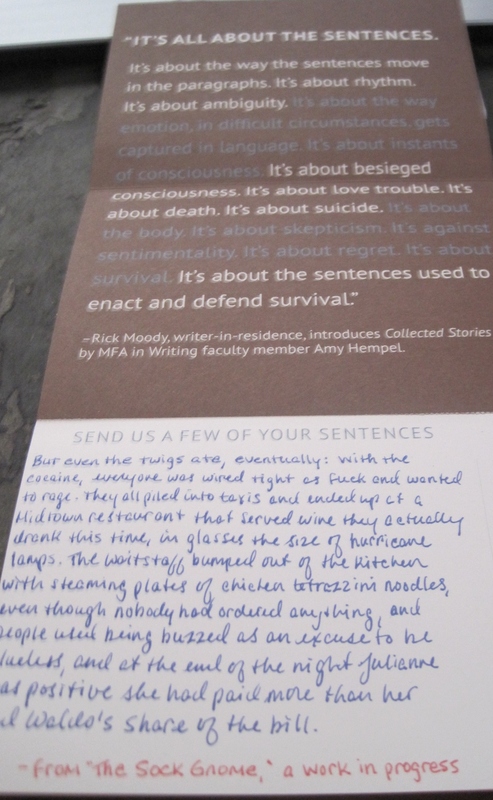 Bennington’s promotional mailer for its low-residency MFA program quotes Rick Moody’s introduction to Amy Hempel’s Collected Stories, on the importance of the sentence as a narrative unit. (“It’s about besieged consciousness. 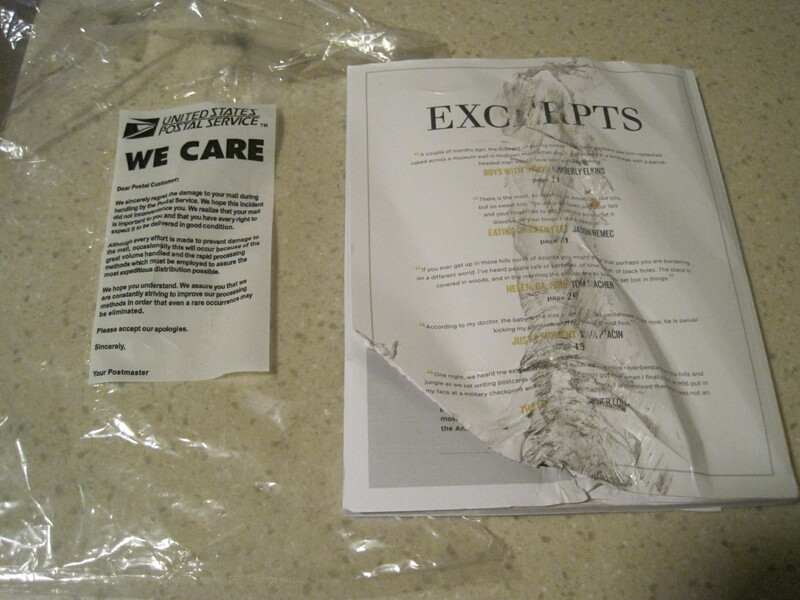 It’s about love trouble.”) The reply card asks you to send a few sentences of your own. I don’t know what they plan to do with them, but here are mine, from a work in progress. If anything, it reminded me that the exercise of writing down (or even rewriting) my words by hand is one I should undertake more often. In the parts of Mambo Kings I have read, Hijuelos shows a distinctive ear for the American babble, the arrogant forward press of youth, and the critical weight of pop culture (e.g., I Love Lucy) and fame as yardsticks of achievement. You can see his influence in Junot Diaz, among others. I’m also seeing hints of Dorothy Baker, and even though I don’t think she wrote about the U.S. much, Jean Rhys (e.g., Voyage in the Dark). There’s something useful about being humbled by the difficulty of what you’re doing, and by the sense that you’re trying to figure it out. It’s maybe better not to know what you’re doing, or at least that’s what I tell myself, because most of the time I really don’t feel that I’ve figured it out. When I was starting out, I’d check out books from the library on how to write, and they were useful to me in that I rebelled against some of the rules. Books and movies are so skewed towards action. You get fired, and that’s the inciting incident, or your wife leaves you, your husband leaves you. You come into some money. You are suddenly mistaken for a CIA operative. Something happens that is completely out of the blue, and you’re expected to have wise, thoughtful reactions to it. But actually, you’ve just become a person who is sort of running and keeping up. I don’t believe that whole thing of: Get the character in a tree and then throw stones at him. I don’t buy it. It’s a very bad piece of advice. I met Baker when he was touring for The Anthologist. The same man who unashamedly gave us Vox and House of Holes turns flush when he speaks about his own accomplishments and influence as a writer. His novels all tunnel down into the buried circuitry of logic and memory, though lately he has turned away from explaining the miraculousness of manmade objects (matches, drinking straws, shoelaces) and more toward humans themselves and their painful limitations. The Anthologist was an instance in which the flaws of the character gave substance to the narrative, and I’m glad that Baker is bringing back Paul Chowder for Traveling Sprinkler. I would like to think that the awarding of the Nobel Prize in Literature to Alice Munro this morning is a further testament to the resurgence of the short story. Most of the waitresses left after Labor Day, to go back to school or college. But the hotel was going to stay open till October, for Thanksgiving, with a reduced staff—Grace among them. There was talk, this year, of opening again in early December for a winter season, or at least a Christmas season, but nobody on the kitchen or dining-room staff seemed to know if this would really happen. Grace wrote to her aunt and uncle as if the Christmas season were a certainty and they should not expect her back anytime soon. Why did she do this? It was not as if she had other plans. Maury was in his final year at college. She had even promised to take him home at Christmas to meet her family. And he had said that Christmas would be a good time to make their engagement formal. He was saving up his summer wages to buy her a diamond ring. She, too, had been saving her wages, so that she would be able to take the bus to Kingston, to visit him during his school term. She spoke of this, promised it, so easily. But did she believe, or even wish, that it would happen? And at The Millions, Ben Dolnick offers “A Beginner’s Guide to Alice Munro,” from July 2012. You are currently viewing the archives for October, 2013 at Neil Serven.